The operations associated with managing and integrating various supply chain activities are called enterprise resource planning (ERP). Observing the success of companies that utilize ERP for supply chain activities, some organizations seek to integrate all of their business management activities using the effective framework. Although ERP is actually a process, the term is closely associated with the information technology system used to perform ERP activities. An ERP system integrates all business operations including internal back office activities, vendor support functions and customer relationship management. The key word that characterizes Enterprise Resource Planning methods best is enterprise, since the framework seeks to eliminate decentralized, stove-piped processes in favor of a strategic level, centralized body of knowledge. 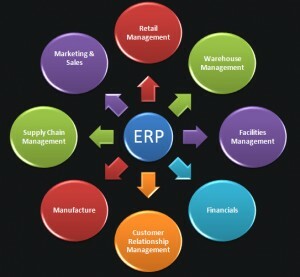 ERP is customizable for organizations operating in various industries. Most companies do not have to start from scratch when it comes to using ERP and associated IT tools, because many related companies use some form of ERP system. Another important trait of ERP is its transparency. Decision makers usually have access to data in near real-time, because of ERP policies, processes and IT tools. Modern ERP systems present organizational leaders with a powerful tool that simplifies and streamlines business processes. Organizations benefit from the centralized nature of Enterprise Research Planning systems, because they are better able to leverage best practices across an organization. Also, coordinating and sharing resources become more efficient when resource planners get a birds eye view of what is available to them. Manufacturing organizations that produce commodity type products and rely on tight supply chains greatly benefit from the performance improvements gained through integrated ERP systems. According to the Emerald Research Register, some of these performance improvements are evident in reduced inventory, increased access to data needed for efficient decision making and fewer errors when interacting with vendors and customers. New streamlined processes also help companies gain and maintain competitive advantages in the market place by facilitating faster time to market for innovative products. Additionally, a simplified resource planning infrastructure sheds light on the best allocation of resources for investment purposes. As with most organizational changes, implementing an Enterprise Resource Planning system takes skill and support. A key challenge to implementing a new ERP system is the identification of all business requirements, which is a missed critical requirement for an ERP system that could postpone the implementation of the entire system. Mishandled enterprise level changes can result in interrupted production and attrition of talented human resources. Some ways to make the transition to ERP easier is to enlist a knowledgeable, influential champion. This champion helps explain the benefits and features of the system to the rest of the organization while gradually garnering support for the new system. Another challenge to overcome during ERP implementation is a lack of training. In an established company, many employees have worked within a particular system for years and introducing a new system requires extensive preparation. Although there are clear benefits to implementing an Enterprise Resource Planning system, embarking on the journey takes both a significant time and financial investment. Successful organizations implement new ERP systems gradually in phases so that they have time to gain buy-in from key leaders, capture missed requirements and provide training to the workforce regarding enterprise resource planning processes.